Patrice Lumumba was the first prime minister of the Republic of the Congo. He was a leading figure in the Congo as that country established its independence from Belgium, which had controlled the Congo since the late nineteenth century. Lumumba's murder in 1961 has made him a symbol of struggle for champions of African nations' attempts to unite and to break free of the influence of the European powers that once colonized (held territory in) the continent. Patrice Emery Lumumba was born on July 2, 1925, in the tiny village of Onalua in northeastern Kasai, a Congolese province (political unit or region). At the time of his birth, the Congo was still a colony (a territory governed by a foreign power) of Belgium. As a child, Lumumba attended Protestant and then Catholic schools run by white mission-aries—that is, by people sent to do religious or charitable work on behalf of their church. At the mission schools, Lumumba proved to be a fine student, even though the mud-brick house he lived in had no electricity and he could not study after dark. In addition, the mission schools were poorly equipped, with few textbooks or basic school supplies. Nevertheless, Lumumba's teachers spotted his quick intelligence and loaned him their own books, encouraging him to advance. Some teachers also found that his intelligence caused them problems, feeling he asked too many troublesome questions. As a young man, Lumumba found a job as a postal clerk in the city of Stanleyville (now called Kisangani) in 1954. There he rapidly became a community leader and organized a postal workers' labor union. His activities were encouraged by local members of the Belgian Liberal political party. In 1957, having been appointed to the position of sales director for a brewery, Lumumba left Stanleyville for the Congo's capital, Léopoldville (now called Kinshasa). There he soon became involved in an important political project. He helped to found the Movement National Congolais (MNC) political party, which aimed to represent all Congolese, rather than representing only the interests of a particular tribe or region. Lumumba's exciting personality and public speaking talents soon won him prominence in this party. to hold local elections that would lead within five years to full Congolese independence. During that year, Lumumba gained recognition as the only truly national figure on the Congo political scene. His persuasive, attractive personality dominated the political meeting called the Luluabourg Congress in April 1959, in which all the political groups who favored a unitary form of government for the Congo—one that would unite tribes and regions into one nation—attempted to establish a common front. However, Lumumba's growing reputation and seemingly radical views caused hostility among other MNC leaders. The result of this disagreement was a split in the party in July 1959. Most of the party's original founders supported Albert Kalonji as their representative, while Lumumba held onto the loyalty of most other party members. Lumumba was briefly imprisoned in November 1959 on charges of encouraging the outbreak of riots in Stanleyville, but he was set free in time to attend the Round Table Conference in Brussels, Belgium. The Belgian government had called for this conference as a forum in which all Congolese political parties could discuss plans for their country's future. At the conference, Lumumba's dramatic presence stole the show from other Congolese leaders. His efforts throughout this period were directed more firmly than those of any other Congolese politician toward the organization of a nationwide movement for an independent Congo. 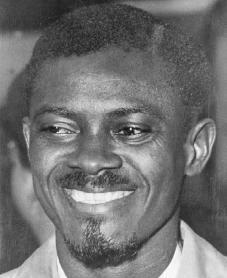 In the May 1960 general elections, Lumumba and his allies won 41 of 137 seats in the National Assembly (the Congo's legislature). They also gained important positions in four of six provincial governments. As leader of the largest single party, Lumumba was somewhat reluctantly selected by the Belgians to become the Congo's first prime minister (and minister of defense) a week before independence. Lumumba's longtime political rival Joseph Kasavubu became president of the republic with Lumumba's apparent support. During his brief time in office, Lumumba had to face an unusually high number of sudden emergencies. These included the revolt of the army and the secession (formal withdrawal from the Congo) of the provinces of Katanga and Southern Kasai, which had been encouraged by Belgian interests and military forces. Lumumba turned to the United Nations (UN) for support, only to discover that it had no intention of accepting his definition of what was best for the Congo. It insisted on opposing the use of any force to alter the situation. Desperate for help, Lumumba asked for support from the Soviet Union to begin military action against the secessionist governments of Southern Kasai and Katanga. He was stopped in this attempt when President Kasavubu dismissed him from office in September 1960. The National Assembly put Lumumba back in power as prime minister, but a small group from the army, led by Colonel Mobutu, took over the government instead. Lumumba was put under unofficial house arrest (confinement in one's home). Meanwhile, his political associates had gone to Stanleyville to organize a rival government. Lumumba slipped out of the capital and tried to make his way toward Stanleyville, but he was arrested by an army patrol and held prisoner in a military camp at Thysville. Even after his imprisonment, Lumumba's reputation and the strength of his followers remained a threat to the unstable new rulers of the Congo. This was demonstrated when Lumumba nearly managed the incredible feat of persuading his military jailers to help him retake power. This incident only strengthened the conviction of authorities in the capital to get rid of Lumumba. They formed a plan to transfer him to either one of the secessionist states of Southern Kasai or Katanga (where he was sure to be executed) as a possible way of reconciling with these two breakaway regions. On January 18, 1961, Lumumba was flown to Elisabethville, the capital of Katanga. There, despite the presence of UN troops, he was picked up by a small group led by Katanga's interior minister and included white mercenaries (professional soldiers hired by a foreign army). He was taken to a nearby house and murdered. The Katanga government made clumsy attempts to cover up the murder, but the shock waves caused by the killing traveled around the world. They created enough international pressure to cause the UN Security Council to permit the use of force as a last resort by UN forces in the Congo. This decision caused events that led to the restoration of a civilian government in Léopoldville and to the eventual end of all movements by regions to secede from the Congo. In addition, Lumumba's tragic murder caused him to be hailed as a hero and symbol for various causes after his death. However, he is best remembered as a passionate believer in the power of African nations to shape their own destinies and free themselves from colonial influence. Heinz, G., and H. Donnay. Lumumba: The Last Fifty Days. New York: Grove Press, 1970. Hoskyns, Catherine. The Congo Since Independence, January 1960—December 1961. New York: Oxford University Press, 1965. Kanza, Thomas R. The Rise and Fall of Patrice Lumumba. Boston: G. K. Hall, 1979. Witte, Ludo de. The Assassination of Lumumba. Edited by Ann Wright and Renee Fenby. New York: Verso, 2001.